"The best electrician service providers around - LB, HB, OC & LA County." Electrical work is what we do. LBC Electricians have been providing top notch electrical services since the 90's. Our clients include home owners, businesses and property owners as we provide electrical work for all habitable infrastructure including offices, residences, homes, parks, warehouses, theaters and more. We're specialists in electrical systems and fixtures needing work/upgrades. We offer the best full range of electrician services in Long Beach. Whether you're looking for surge repairs, re-wiring of your electrical conduit wires, heating/cooling maintenance, outlet wiring or anything, we're the electrical contractors in Long Beach you should call. Trust us with your next project - we wont' disappoint. Learn More About Long Beach Electricians and what we do. Quality Control & Emergencies! Our roots go way back to taking care of minor electrical repairs on cars and minor residential electrician services. 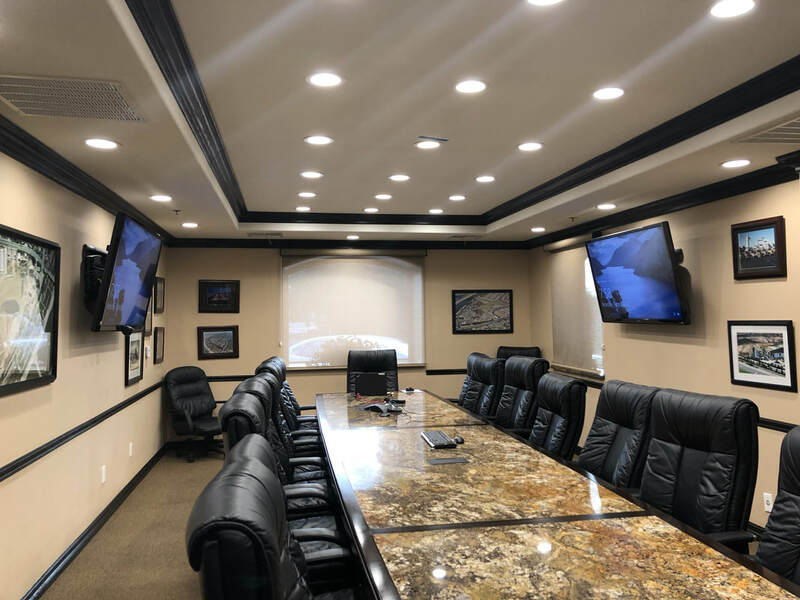 Working for various tradesmen and companies, we started our contracting business with our years of experience and has developed us into a high-quality electrical contractor in the city of Long Beach CA. As a player in the electrical contracting market here in LA/OC, we've built a reputation to take care of emergency electrical services, upgrades, custom lighting projects, power surges, outlet wiring, etc. However, we always stress the importance of frequent inspections and audits of your home's wiring and electrical system to assure your house or building is up to code and most importantly, safe. ​Convinced we can help? Give us a call today to schedule a site visit or estimate - you'll be happy you did. Don't forget to ask for first-time discounts. RJN Computer Room Wiring - Re-wired new conference room for the RJ Noble Company including new ceiling lights, computer network set-ups and surround-sound speakers. Commercial Electrical Improvements - We installed the entire electrical system wiring for the 3rd floor of our client's building in Long Beach CA as well as their Huntington Beach stand-alone office. Property Security Camera Installation - We installed a security camera system for our Long Beach client including 12 new cameras and a computer video detection system. Breaker Box Install - Again for JGT, we installed their new breaker to sustain/retrofit their new electrical needs. Commercial electrical clients are a huge sector of our growing business as we've helped so many businesses in Long Beach with their needs. This includes re-wiring of their current electrical systems, outlet expansions, custom lighting, generator installations, multi-floor wiring, repairs and more. Our staff can assess the electrical needs of a property and will provide recommendations and improvements based on any budget and desire. We're a licensed industrial electrician company that is well-versed in any stringent and difficult industrial need. Factories, Departments - we can do it all. A popular service among DIYers, our staff can install any custom home wiring or commercial wiring to address your set-up requirements. We know all about wiring best-practices, auditing, testing and quality assurance to provide the most affordable and feasible electrical wiring in Long Beach. Licensed and certified among various certification governing bodies, we're awesome at custom projects and repairing any wiring while making sure your environment and fixtures are safe from any potential electrical hazards or emergencies. We specialize in installation interior and exterior lighting for both residential and commercial clients in Long Beach. This includes all repairs, upgrades, fixtures and solar recommendations that can benefit your situations as well. We're a licensed electrical contracting company that can handle public works, routing maintenance services and private bid opportunities as they come available. Do you have a 911 electrical problem? Give us a call 24 hours a day/7 days a week as we can offer on-call electrical services in LB at any level. If you're looking for a ceiling fan installation, doorbell installation, appliance repair, smoke detector, panel upgrade or more, we've got you covered. Have a different electrical need in mind? We're 99% we can take care of that as well. If you're looking for a Long Beach electrical contractor that's a) highly rated, b) provides affordable services, c) offers the most electrical services in LB and d) can handle big electrical system projects, give us a call! We cover every neighborhood of Long Beach, Huntington Beach as well as expanding into the greater Orange County and Los Angeles County areas. We've ventured far for some of our clients and currently service commercial electrical projects all over Orange County. It isn't how many clients we service but how big of a service we can provide to each client do take care of. The #1 electrician company in Long Beach. We can solve ​any electrical problem. Your home or commercial property is meant to kept maintained and optimized for it's most efficient use. As electrical contractors, our job is to provide any electrical service at the most efficient levels and lowest prices. And in doing so, we've been able to grow a sustainable company that focuses on all types of electrician services. If you're looking for an electrician that can handle any problem and address any unknown issues that may arise, we fit the bill perfectly. We've never had a client walk away upon business inquiries due to a lack of serviceability. We're professional electricians that do electric work at the residential, commercial and industrial level. We've never skipped a bit and we never will. Our customers love us. We provide amazing electrical repairs and service in Long Beach that we've managed a 80% client retention rate for their future electrical service needs. Our highly rated reviews and activity online only helps further cement our status of a premier electrician around LB, HB & Orange County. We love receiving feedback as our number one priority is providing the best electrical services in town. Recommendations and awesome feedback makes us even work harder to maintain our most trusted title in tact as well. You can trust in us to provide not only be the most professional auto detailing business but also the most credible in Long Beach. We're certified detailers meaning we've taken courses to not only enhance but to qualify and certify our car detailing and cleaning services. You'll never have to worry if we can do the job - we've got all bases and corners covered. Every single one of our interior cleaning or full detailing and washing services are very competitive and fair. We not only provide a five-star job but do a fantastic job in not over-pricing new clients. We know how important a vehicle's health and look to it's owner and we don't charge an arm and a leg to get it cleaned and detailed again. Contact us today to take care of your electrical service needs! Our main conventional active phone hours are 7am to 7pm, Monday to Saturday though you are more than welcome to call us off-hours for any emergencies or immediate scheduling. We cater every one of our clients at the residential, commercial and industrial level! We look forward to assessing your electrical service need!